Admire the great outdoors while you stock up on firewood. 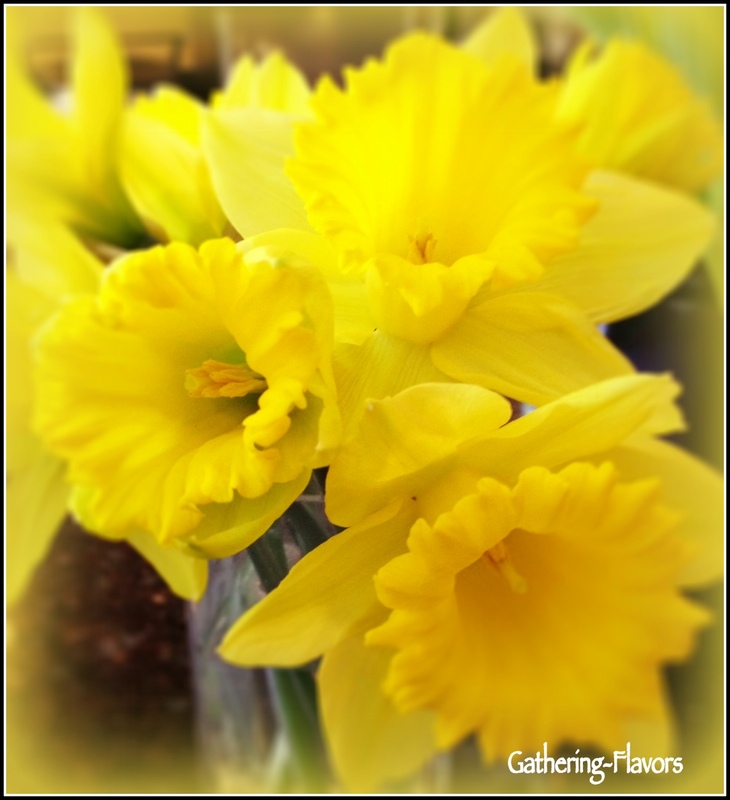 Fill house with daffodils. Lots of daffodils. Bake cookies, like these Peanut Butter Crunch Cookies. Cuddle up by fire with book, cookies and loved ones. In a small bowl, sift together the flour, baking powder, baking soda and salt. In a standing mixer fitted with the paddle attachment, beat the butter, peanut butter and oil on medium speed until smooth and creamy. Blend in the brown sugar. Add the eggs and vanilla and beat until smoothly blended. Turn the speed to low, add the flour mixture and mix just until it is well incorporated. Form the cookie dough into 30 small balls. Cover and refrigerate for a minimum of 3 hours or up to 24 hours before baking. When you are ready to bake, preheat oven to 375 degrees F. Line two cookie sheets with parchment paper. Spread the crushed honey roasted peanuts out on a small plate or cutting board. Press each cookie into the nuts, then place each cookie ball on the prepared baking sheets, with the nut side up. Space the cookies about 1 inch apart from one another. Using the back of a fork, flatten the cookies on the baking sheets. Bake until the cookies are lightly browned around the edges, about 15 to 20 minutes. Allow to cool completely. Remove from pan and store in an airtight container until ready to serve. This recipe is closely adapted from Vegetable Literacyby Deborah Madison.